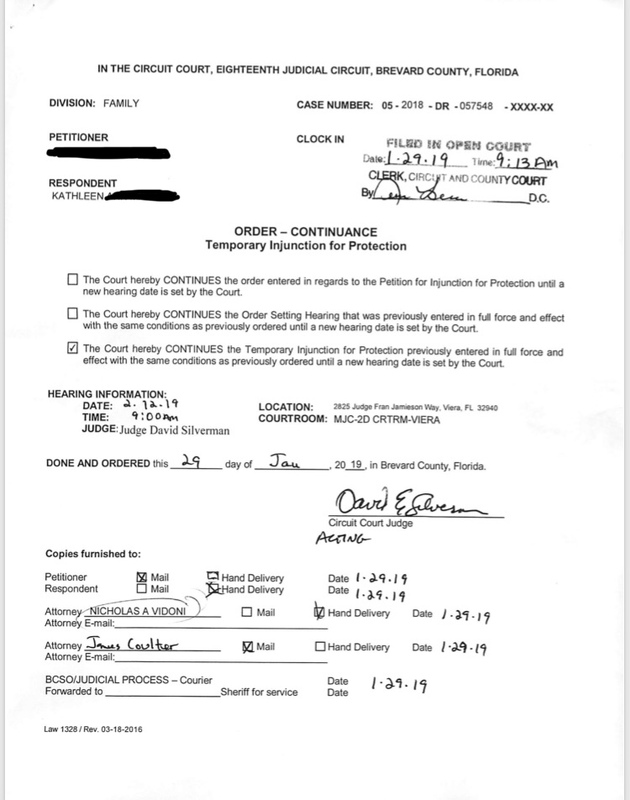 Mar 20, 2019 Posted by AAfterwit on Mar 20, 2019 | Comments Off on Satellite Beach: The Many Missteps And Accusations – Some Accidental, Some Planned. Satellite Beach: The Many Missteps And Accusations – Some Accidental, Some Planned. We wrote yesterday about the handling of the citizens’ concerns in Satellite Beach and how the City failed to uphold the law in many cases. In addition, we wrote how being disruptive in a meeting is not productive for a variety of reasons. In other words, so far while some hands are “dirtier” than others, no one has “clean hands” in this entire mess. Today we want to look at some missteps made by the City, people and groups. We know that this list will not make some people happy, but we think that it is important. But an epidemiological study ultimately showed that the cancer rate was no greater than that of the general population. The rate was actually slightly less. Hinkley, California, the town made famous in the Oscar-winning Julia Roberts movie Erin Brockovich, does not show any evidence of an increased rate of cancers. Of the $333 million settlement paid by PG&E, the lawyers kept a handsome 40 percent ($133 million) share, plus another $10 million to cover expenses. The clients say they were short on detail to back up the latter number. Worse, they say Masry, Brockovich, et al. held onto their money for six months after the settlement, a delay that appeared highly irregular to the experts Sharp checked with, while not paying interest or even returning their phone calls (the lawyers say the payments did include interest). Some with large awards also got steered toward certain financial advisers, among them Ed Masry’s son Louis. When the payouts eventually came, many clients found the division of spoils mysterious, arbitrary, or worse. Divided among the 650 plaintiffs, the announced $196 million would provide about $300,000 per client. But an outside lawyer who interviewed 81 of the plaintiffs was told they received an average of $152,000, and Sharp reports that many long-term residents with presumably documented medical ailments got payments of $50,000 or $60,000. The allocation among clients was kept secret, which means they couldn’t get an accounting of who received what–gotta protect the privacy of the other plaintiffs, right? After Hinkley, Brockvich set her sights on Toms River, New Jersey where a “cancer cluster” was alleged. As actual studies were performed, the alleged links to cancer in children was so weak that it was not proven, despite people’s claims. Even the cases that everyone was sure of – cancer causing agents in the Love Canal (the first EPA Superfund Cleanup site) and breast cancer in Long Island were shown to be unfounded. Feel free to disagree with us, and we understand why you may, but bringing Brockovich into the discussion does not help the situation at all. Her history in these matters is littered with false claims and she seems to be more interested in signing people up for class action suits than the actual science and remedies. We believe that bringing Brockovich into this matter was a misstep – a well intentioned misstep, but a misstep nonetheless. Far more egregious was the City of Satellite Beach and their relationship with an individual named Kathy Marler. Marler, you may remember, was allowed as a resident into the September 17, 2019 meeting where she was listed as a “Cancer Advocate and Parent of Cancer Survivor.” The label is somewhat confusing as it would seem to indicate that having a child with cancer and advocating for answers would have allowed the parent into the meeting. That wasn’t the case. Parents with ill children were excluded from the meeting so what happened? Marler has developed a relationship with the City Manager of Satellite Beach, Courtney Barker. The relationship extended to the City offering printing services for Marler. 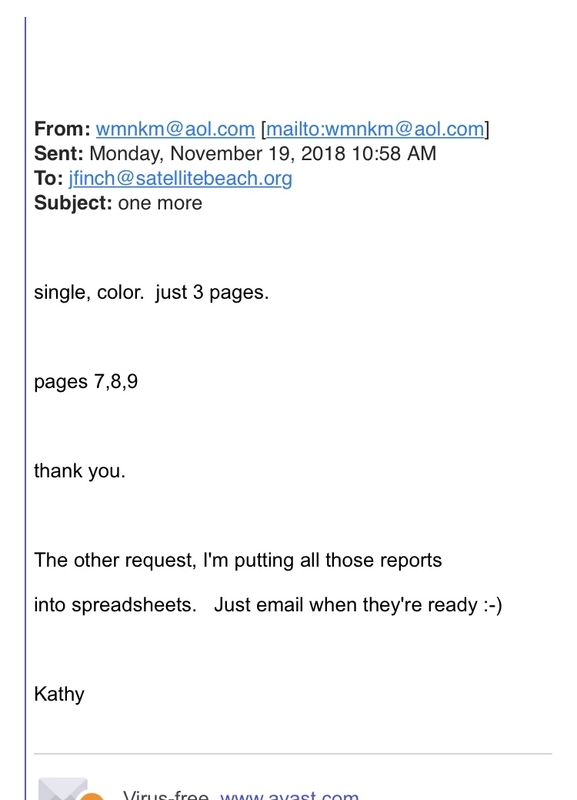 Marler began to harass at least one person over these issues to the point where after a legal demand letter to cease was sent, Marler wrote a screed that was delivered by the USPS to the home of the person. The screed must be seen to be believed. A judge found the activities of Marler so bad, that he issued a restraining order against Marler yet the City still communicated with her in a positive and grateful manner. The City for its part was still busy. After a person wrote a letter to Mayor Catino on censorship and questioning the City’s actions, City Manager Barker asked Chief of Police Pearson if the address the person had given was in the City to which Pearson replied that he would drive by the person’s house to make sure of the address. The Chief of Police of Satellite Beach, with the blessings of the City Manager, decided to drive by a home because the person had written a communication with the City of Satellite Beach. Express an opinion, get visited by the police. Yet the City is not the only entity in trying to suppress ideas and opinions. One of the more common refrains we have heard from citizens groups is that anyone who disagrees with the group must only be concerned with “property values” and therefore don’t want to get to the bottom of any problems. We were accused of that after we wrote that people making statements needed to be accurate. An nationally renowned expert on contaminations and migration had the charge of a “conflict of interest” leveled against him after he disagreed with an individual who then stated the man had a conflict of interest because he lives in the area. 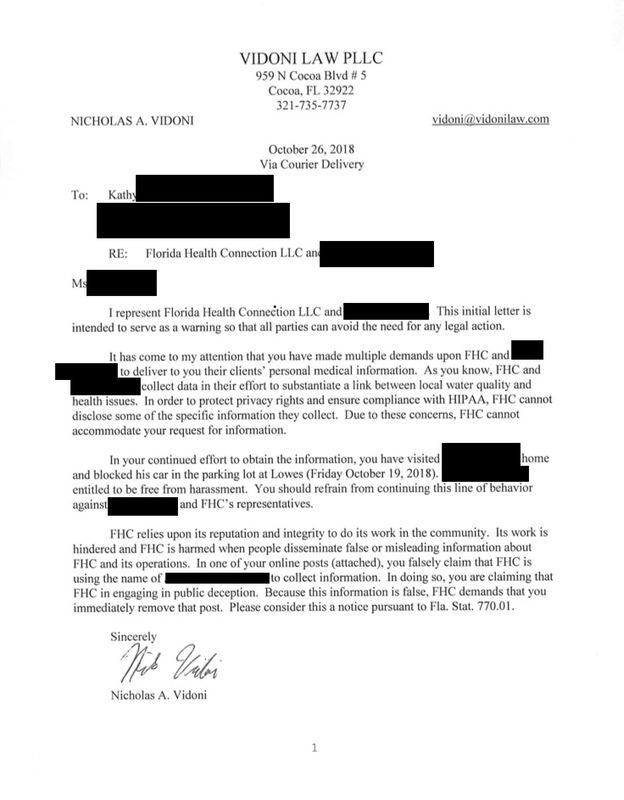 The Brevard County Clerk of the Courts has been accused of slow-playing records requests even though the requests require more work in order to make sure that exempted information is not released. The same charges are made against members of the City government. We find such allegations (without any proof) to be reckless, irresponsible and despicable. First, let’s deal with the money issue. Previous research indicates that contaminated sites, including Superfund and other types of hazardous waste sites are likely to affect nearby residential property price reductions, due to the nearby hazardous waste sites from two to eight percent of the value of the property. One study of several Superfund sites in Houston, Texas found that property values rebounded fairly quickly following completion of cleanup activities. Two to eight percent. That’s what we are talking about. While not insignificant, it is not catastrophic and will rebound once causes and remedies if needed can be determined. If you are really that concerned with health issues, would you risk the health of your family over 2% – 8% of your property value? Is that the type of person you are? The entire City Council as well as the City Manager lives in Satellite Beach. Catino raised a family here with sons who all went to Satellite High. Brimer has two sons that attended Satellite High. Gibson has been in the area for over 30 years and has three daughters. Barker has a young child. The Clerk of the Court’s parents live in the City of Satellite Beach. 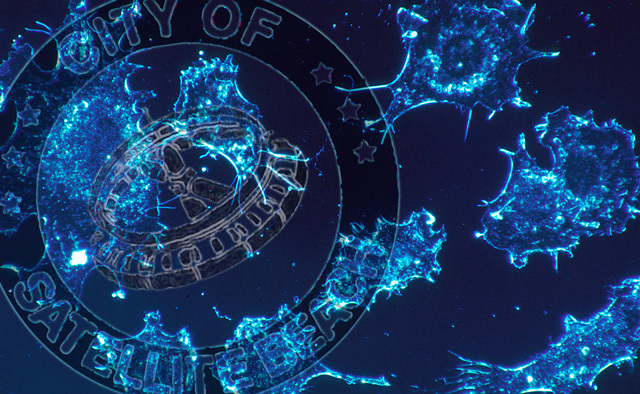 The ground water / contamination expert lives in the un-incorporated area of Satellite Beach. All of these people are in the City and are staying in the City and yet some yahoos think that they would put the health of their families and loved ones at risk for some money on property values. Ask anyone who has ever had a family member who suffered with cancer if they would have given 2% – 8% of their property value to disregard the health issues. You will get laughed at because most people will say they would give their homes and life savings in order to save loved ones from cancer. Yet some people are saying that “property values” are more important to people than figuring out what is going on. Many of our staff here spent years in positions of authority and in environments where cheating and allegations of cheating were rampant. To be clearer, we have a lot of sports officials on staff. There is not a one who does not know and agree that players, managers, and coaches who wrongfully accuse others of cheating do so because they would or are doing the same thing – the same cheating acts. If you think that people who live in this community don’t care about the health and well being of their families and care more about the value of a building and some dirt, that says more about you than it does about them. We also want to address something that Councilman Montanero said at the last Council meeting in discussing accusations of false and misleading information. We think that Montanero was talking about the costs of research and in that limited instance he may be right. But the fact of the matter is that people in incorporated Satellite Beach are getting ill. That makes it a City of Satellite Beach problem. While the City in many cases looks and says “that person is not from our City” as a way to dismiss other people, the real truth is that contaminates don’t care about lines on a map designating towns and unincorporated areas. The contaminates don’t give a rat’s patootie about jurisdictional issues and boundaries. So like it or not, what box or boundary on a map a person lives in beachside doesn’t matter to the issue. If you were the State of Florida or the County Commission, would you listen more to 11,000 people in incorporated Satellite Beach or listen to a group comprised of 8,000 people in Indian Harbor Beach, PLUS 11,000 people from Satellite Beach incorporated PLUS 10,000 in the South Patrick Shores / Satellite Beach unincorporated area PLUS whatever number is on Patrick Air Force Base PLUS whatever number of people live between PAFB and the southern border of Cocoa Beach PLUS 12,000 people living in Cocoa Beach? Which group is going to get your attention more? That’s why we as a large community with a common interest and goal have to band together. We really don’t understand those who are actively making comments about others simply because they disagree with them. That goes for the groups, individuals and the City of Satellite Beach. If you want to just be disruptive your input is not needed. If you can’t work with people that disagree with you, your input is not needed. Clearly there is much work to be done and the City of Satellite Beach needs to be open to more transparency and less less of a “bunker mentality. At the same time, people, groups and the City have to stop being confrontational and getting in people’s faces and instead work together. As we said, it doesn’t seem to us that there is any one “player” in this theater that has “clean hands.” Certainly there are some hands that are dirtier than others, but “they did it too!” is not a good moral standard to have. We sincerely hope and pray that people stop, hit the “reset” button and move forward.